Worldwide English, León, Guanajuato. TIE Examinations. Worldwide English meets the needs of students and companies by offering courses of the highest quality. 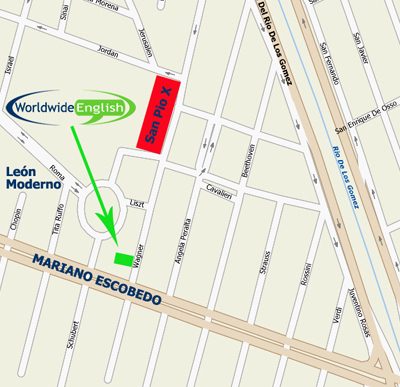 Located in León Moderno, León, courses are conducted both in the school and on company premises. Whether it be to study General English, Examination Preparation, Business English or English for Specific Purposes - group or individual classes - all students’ needs are catered for with highly trained teaching and administrative staff. All levels are conducted from Beginners to Advanced and correlate to the Council of Europe’s Common Framework of Language Proficiency. Students are given a written and oral test on arrival to help determine their level of English so that they are placed in an appropriate class. On successful completion of their course a certificate is awarded. All courses are based on the most up-to-date methodologies, course books and authentic materials. Worldwide English is the only school in Mexico that is a TIE and ETAPP Examinations Centre, recognised by the Department of Education, Ireland. At Worldwide English, students work with highly trained and motivated English language teachers who have been chosen for their qualifications, experience and ability to work enthusiastically with students. All teachers are all university graduates with recognised EFL qualifications and above all, many years of successful teaching experience. They provide every possible opportunity to get the most from the students’ time in the school. There are regular programmes of extra curricular activities for students, which take place in the afternoons, evenings and/or at weekends. Such activities consist of our conversation clubs in local cafés and bars, group trips to the cinema and day trips to places of interest. All of which are conducted in English!!! Students can watch videos, have coffee and socialise in the school after class. We look forward to working with you soon!! !